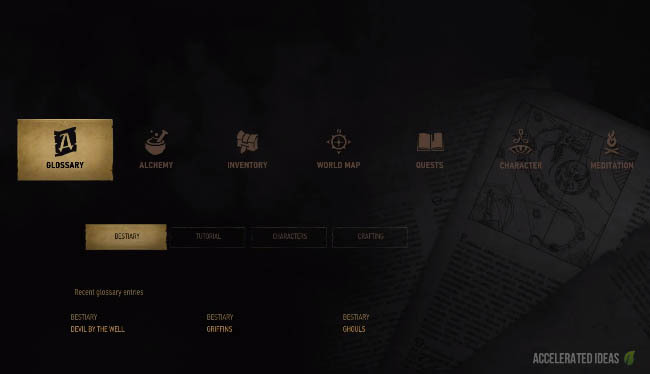 The bestiary is very important item in the Witcher 3, especially on the tougher difficulties. Looking similar to a monster hunter diary, it includes lots of information on the monsters you encounter in the game including their habits, how they attack you and also their weakness. There's a great variety of monsters in the game ranging from those that spread fire, others which attempt to hypnotise you and even odd little creatures that disappear and hide underground. In each case, you'll need to use precise tactics to defeat each of them. In this post I'll be listing all of the known monsters in the Witcher 3 together with the important Bestiary facts including which items they are vulnerable against, where to find them and some strategies to help you defeat them. The initial Bestiary screen is split into 3 sections; the left side contains a navigable list of all the monsters, the middle area displays an image whilst the right side displays detailed information about the selected monster. Note: New entries are only added to the bestiary after you find an important piece of information or you actually kill one of the monsters for yourself. Griffins were once only found high in the mountains, where they would hunt marmots and wild goats. When humans encroached on their lands, however, griffins soon discovered a new source of much more plentiful and easier-caught prey: cows, sheep and shepherds. Though still wary of main roads and towns (where folk with the means to hire a witcher are like to dwell), these half-eagle, half-wildcat creatures have gone from rarities to oft-encountered pests known throughout the Northern Realms. Especially hated are the subspecies known as royal griffins and archgriffins. The middle section for the Griffin shows the Vulnerable Agents for this monster. These are the weapons you should be using to defeat this monster quickly. Ok, here's the list of all monsters in the game taken directly from the Bestiary. The half bird, half cat creature found at the beginning of the game. Vulnerable against: Aard Sign. Human like monsters that crawl on all fours. These ghostly creatures appear most commonly at midday, usually in areas with emotional significance to the particular wraith. 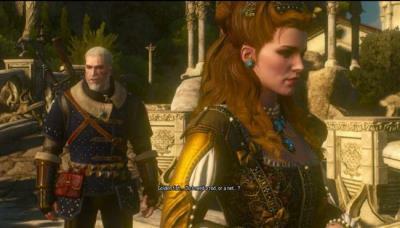 As the Witcher you must learn the secret that binds them to that place before they will appear. A good example of a Noonwraith encounter is during the Witcher Contract quest called Devil by the Well. Noonwraiths are vulnerable to the Yrden Sign which must be used to trap the Noonwraith and force it to take on its material form. Commonly found in wetland areas such as sewers, swamps and lakes. These creatures appear at night, usually in groups. Geralt should use his Silver Sword in addition to knockdown skills. These "living boulder" creatures are used as guards (sentinels) to protect a forbidden area from infiltration. In the Witcher 3 you encounter an Earth Elemental as you explore the underground chambers with Yennefer in the King is Dead mission. It’s not that hard to defeat these rock monsters if you attack from the side and use appropriate oils for your blades. Although they have a typical brawlers hook attack, Elementals are slow and can be dodged fairly easily. Half human and half dragon, these ugly but huge monsters swoop down from the sky causing massive damage. These insect like creatures are commonly found at ground level near monster nest. The Warrior version is a strong scorpion like creature whilst the Workers are similar in appearance to spiders. Both of these creatures are fairly easy to kill but be wary of the stronger Warriors pincers. A strong sword and good timing will serve you well against the Endrega’s. Another new addition to the Witcher 3, this three-eyed monster looks similar to a large elk with werewolf features. The Fiend uses a ram attack combined with a magic spell to disorientate Geralt, surrounding him in complete darkness. Human like in appearance these magical beings are mainly found in swamps, forests, or in the mountains - particularly when fog starts to appear. They use magic to lure their prey into custom made traps. Since these creatures can blend in incredibly well with the surroundings, Geralt must use the AARD Sign which causes them to become tangible, giving the opportunity to use blades and other weapons to defeat them. Found on the Islands of Skellige, this huge monster is new to the Witcher 3. He takes shipwreck debris as his armour and a large chained anchor as his primary weapon. This monster should not be underestimated and Geralt should use his best weapons for this encounter, particularly fire spells and fire Alchemy. Water Hags are skeletal witch creatures that inhabit wetland areas including swamps and bogs. A good example of a Water Hag is the Bilge Hag encountered in No Mans Land. 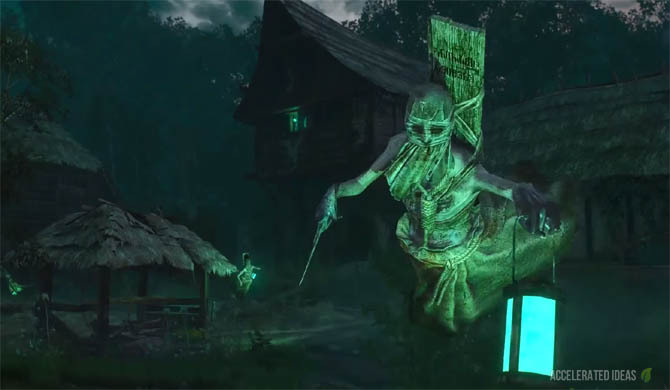 The Water Hags unique attacks include a “mud toss” which obscures the players vision by blocking part of the game view and a teleport move where the Water Hag disappears through the ground and reappears in another location. Players should use careful timing and the fire spell (Igni) to destroy a Water Hag.